President Thomas Jefferson commissioned the expedition shortly after the Louisiana Purchase in 1803 to explore and to map the newly acquired territory, to find a practical route across the western half of the continent, and to establish an American presence in this territory before Britain and other European powers tried to claim it. The campaign's secondary objectives were scientific and economic: to study the area's plants, animal life, and geography, and to establish trade with local Native American tribes. With maps, sketches, and journals in hand, the expedition returned to St. Louis to report its findings to Jefferson. According to Thomas Jefferson himself, one goal was to find "the most direct and practicable water communication across this continent, for the purposes of commerce." Jefferson also placed special importance on declaring U.S. sovereignty over the land occupied by the many different tribes of Native Americans along the Missouri River, and getting an accurate sense of the resources in the recently completed Louisiana Purchase. The expedition made notable contributions to science, but scientific research was not the main goal of the mission. During the 19th century, references to Lewis and Clark "scarcely appeared" in history books even during the United States Centennial in 1876 and the expedition was largely forgotten. Lewis and Clark began to gain new attention around the start of the 20th century. Both the 1904 Louisiana Purchase Exposition, in St. Louis, and the 1905 Lewis and Clark Centennial Exposition, in Portland, Oregon, showcased Lewis and Clark as American pioneers. However, the story remained relatively shallow, a celebration of U.S. conquest and personal adventures, until the mid-century, since which time it has been more thoroughly researched and retold in many forms to a growing audience. In 2004, a complete and reliable set of the expedition's journals was compiled by Gary E. Moulton. In the 2000s, the bicentennial of the expedition further elevated popular interest in Lewis and Clark. As of 1984, no U.S. exploration party was more famous, and no American expedition leaders are more instantly recognizable by name. May 25: The expedition passes the small village of La Charrette on the Missouri River. Charles Floyd writes in his journal that this is "the last settlement of whites on this river". August 1: Captain William Clark's 34th birthday. August 18: George Drouillard returns to camp with Reed and Otos' Chief Little Thief. Reed is sentenced to run the gauntlet (500 lashes) and is discharged from the permanent party. August 18: Captain Meriwether Lewis's 30th birthday. August 30: A friendly council with the Yankton Sioux held. According to a legend, Lewis wraps a newborn baby in a United States flag and declares him "an American". January 1: The Corps of Discovery celebrates the New Year by "Two discharges of cannon and Musick—a fiddle, tambereen and a sounden horn." February 9: Thomas Howard scaled the fort wall and a native American followed his example. "Setting a pernicious example to the savages" 50 lashes—only trial at Fort Mandan and last on expedition. Lashes remitted by Lewis. 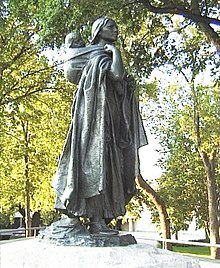 February 11: Sacagawea gives birth to Jean Baptiste Charbonneau, the youngest member of the expedition. Jean Baptiste is nicknamed "Pompy" by Clark. Lewis aided in the delivery of Sacagawea's baby, used rattle of rattlesnake to aid delivery (Jessaume's idea). May 14: A sudden storm tips a pirogue (boat) and many items, such as supplies and the Corps' journals, spill over into the river. Sacagawea calmly recovers most of the items; Clark later credits her with quick thinking. May 8: Milk river. Called because of its milky white appearance. Natives called it "a river which scolds all others". June 3: The mouth of the Marias River is reached. Camp Deposit is established. Cached blacksmith bellows and tools, bear skins, axes, auger, files, two kegs of parched corn, two kegs of pork, a keg of salt, chisels, tin cups, two rifles, beaver traps. Twenty-four lb of powder in lead kegs in separate caches. Hid red pirogue. Natives did not tell them of this river. Unable to immediately determine which river is the Missouri, a scouting party is sent to explore each branch, North fork (Marias), South fork (Missouri). Sgt. Gass and two others go up south fork. Sgt. Pryor and two others go up north fork. Can't decide which river is Missouri. Clark, Gass, Shannon, York and Fields brothers go up south fork. Lewis, Drouillard, Shields, Windsor Pryor, Cruzatte, Lepage go up north fork. Most men in expedition believe north fork is the Missouri. Lewis and Clark believe south fork is Missouri and followed that fork. June 13: Scouting ahead of the expedition, Lewis and four companions sight the Great Falls of the Missouri River, confirming that they were heading in the right direction. Lewis writes when he discovers the Great Falls of the Missouri. "When my ears were saluted with the agreeable sound of a fall of water and advancing a little further I saw the spray arrise above the plain like a column of smoke.....began to make a roaring too tremendous to be mistaken for any cause short of the great falls of the Missouri." August 1: Captain Clark's 35th birthday. August 18: Captain Lewis's 31st birthday. In his journal, he scolds himself for being "indolent", or lazy, and vows to spend the rest of his life helping people. September 4: Meet Salish ("Flathead Indians") at Ross's Hole, bought 13 more horses. September 9–11: Camped at Traveler's Rest (Lolo, Montana), now a National Historic Landmark. November 7: Clark wrote in his journal, "Ocian [ocean] in view! O! the joy." December 25: Fort Clatsop, the Corps' winter residence, is completed. April 11: Lewis' dog was stolen by natives and retrieved shortly. Lewis warned the chief that any other wrongdoing or mischievous acts would result in instant death. June 10–30: Traveled to Traveler's Rest (Lolo, Montana) via Lolo Creek. Three hundred miles shorter than westward journey. Seventeen horses and five Nez Perce guides. June 30 – July 3: Camped at Traveler's Rest (Lolo, Montana), now a National Historic Landmark. July 3–28: Lewis's party heads back to the Great Falls of the Missouri. Sgt. Gass, J. Thompson, H. McNeal, R. Field, R. Frazier, J. Fields, W. Werner, G. Drouillard, S. Goodrich. July 7: Lewis' group crosses the Continental Divide at Lewis and Clark Pass. July 20: Sgt. Ordway's party (from Clark's party) meets Sgt. Gass's party at the Great Falls of the Missouri. July 27: Piikani Nation tribe members ("Blackfeet") try to steal Lewis's group's rifles. A fight broke out and two natives Americans were killed in the only hostile and violent encounter with a tribe. July 6: Clark's group crosses the Continental Divide at Gibbons Pass. July 25: Clark discovers and writes on Pompey's Pillar. August 1: Capt. Clark's 36th birthday. August 18: Capt. Lewis's 32nd birthday. For years, Jefferson had heard of and read accounts of the various ventures of other explorers in parts of the western frontier and consequently had a long-held interest in further exploring this largely still unknown region of the continent. In the 1780s, while Minister to France, Jefferson met John Ledyard in Paris and discussed a proposed trip to the Pacific Northwest. Jefferson had also read Captain James Cook's A Voyage to the Pacific Ocean (London, 1784), an account of Cook's third voyage, and Le Page du Pratz's The History of Louisiana (London, 1763), all of which greatly influenced his decision to send an expedition. Like Captain Cook, Jefferson also wished to discover a practical route through the Northwest to the Pacific coast. Alexander Mackenzie had already charted a route in his quest for the Pacific, first following the later-named Mackenzie River to the Arctic Ocean in 1789. 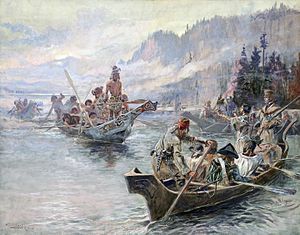 Mackenzie and his party then became the first on record to cross America north of Mexico to the Pacific, when he arrived near Bella Coola in 1793—a dozen years before Lewis and Clark. Mackenzie's accounts in Voyages from Montreal (1801) informed Jefferson (who read the book at Monticello in 1802) of Britain's intent to control the lucrative fur trade of the Columbia River, and convinced him of the importance of securing the territory as soon as possible. Two years into his presidency, Jefferson asked Congress to fund an expedition through the Louisiana territory to the Pacific Ocean. He did not attempt to hide the Lewis and Clark expedition itself from Spanish, French, and British officials, but rather claimed different reasons for the venture. He used a secret message to ask for funding due to poor relations with the opposition party in Congress. 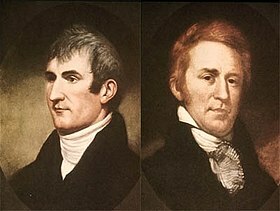 In 1803, Jefferson commissioned the Corps of Discovery, and named U.S. Army Captain Meriwether Lewis its leader, who in turn selected William Clark as second in command. Lewis demonstrated remarkable skills and potential as a frontiersman. As the expedition was gaining approval and funding, Jefferson made efforts to prepare him for the long journey ahead. Jefferson chose Lewis to lead the expedition rather than a "qualified scientist" because, "It was impossible to find a character who to a complete science in botany, natural history, mineralogy & astronomy, joined the firmness of constitution & character, prudence, habits adapted to the woods & a familiarity with the Indian manners and character, requisite for this undertaking. All the latter qualifications Capt. Lewis has." In 1803, Jefferson sent Lewis to Philadelphia to study medicinal cures under Benjamin Rush, a physician and humanitarian. Jefferson also arranged for Lewis to be further educated by Andrew Ellicott, an astronomer who instructed him in the use of the sextant and other navigational instruments. Lewis, however, was not ignorant of science and had demonstrated to Jefferson a marked capacity to learn, especially with Jefferson as his teacher. At Monticello, Jefferson possessed the largest library in the world on the subject of the geography of the North American continent, and Lewis had full access to that library. Lewis spent time consulting maps and books and conferring with Jefferson at Jefferson's library in Monticello. The U.S. mint prepared special silver medals with a portrait of Jefferson and inscribed with a message of friendship and peace, called Indian Peace Medals. The soldiers were to distribute them to the nations they met. These symbolized U.S. sovereignty over the indigenous inhabitants. The expedition also prepared advanced weapons to display their military firepower. Among these was an Austrian-made .46 caliber Girandoni air rifle, a repeating rifle with a 20-round tubular magazine that was powerful enough to kill a deer. The expedition was prepared with sufficient black powder and lead for their flintlock firearms, knives, blacksmithing supplies, and cartography equipment. They also carried flags, gift bundles, medicine, and other items they would need for their journey. Much time went into ensuring a sufficient supply of these items. 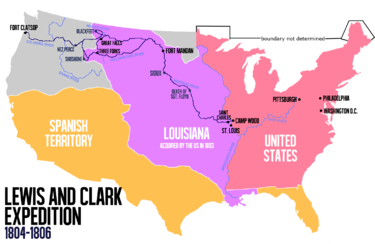 The route of Lewis and Clark's expedition took them up the Missouri River to its headwaters, then on to the Pacific Ocean via the Columbia River, and may have been influenced by the purported transcontinental journey of Moncacht-Apé by the same route about a century before. Jefferson had a copy of Le Page's book detailing Moncacht-Apé's itinerary in his library, and Lewis carried a copy with him during the expedition. Le Page's description of Moncacht-Apé's route across the continent, which neglects to mention the need to cross the Rocky Mountains, may be the source of Lewis and Clark's mistaken belief that they could easily carry boats from the Missouri's headwaters to the westward-flowing Columbia. The historian John L. Loos of Louisiana State University wrote William Clark's Part in the Preparation of the Lewis and Clark Expedition, a 511-page manuscript published in 1954 by the Missouri Historical Society. Thirty-three people, including 29 participants in training at the 1803–1804 Camp Dubois (Camp Wood) winter staging area, then in the Indiana Territory, were near present-day Wood River, Illinois, on the east bank of the Mississippi. In March 1804, the Spanish in New Mexico learned from U.S. General James Wilkinson, later discovered to be a paid agent of the Spanish crown,[note 1] that the Americans were encroaching on territory claimed by Spain. On August 1, they sent four armed expeditions of 52 soldiers, mercenaries, and Indians from Santa Fe northward under Pedro Vial and José Jarvet, to intercept Lewis and Clark and imprison the entire expedition. When they reached the Pawnee settlement on the Platte River in central Nebraska, they learned that the expedition had been there many days before, but because the expedition at that point was covering 70 to 80 miles (110 to 130 km) a day, Vial's attempt to intercept them was unsuccessful. The Corps of Discovery departed from Camp Dubois at 4 pm on May 14, 1804, and met up with Lewis in St. Charles, Missouri, a short time later, marking the beginning of the voyage to the Pacific coast. The Corps followed the Missouri River westward. Soon, they passed La Charrette, the last Euro-American settlement on the Missouri River. They made their way to Camp Chopunnish[note 2] in Idaho, along the north bank of the Clearwater River, where the members of the expedition collected 65 horses in preparation to cross the Bitterroot Mountains, lying between modern-day Idaho and western Montana. However, the range was still covered in snow, which prevented the expedition from making the crossing. On April 11, while the Corps was waiting for the snow to diminish, Lewis' dog, Seaman, was stolen by Indians, but was retrieved shortly. Worried that other such acts might follow, Lewis warned the chief that any other wrongdoing or mischievous acts would result in instant death. One of the primary objectives of the expedition as directed by President Jefferson was to observe and record the whereabouts, lives, activities, and cultures of the various American Indian tribes that inhabited the newly acquired territory and the northwest in general. The expedition encountered many different tribes along the way, many of whom offered their assistance, providing the expedition with their knowledge of the wilderness and with the acquisition of food. Along with the standard provisions of weapons, powder, tools, and cooking utensils, the expedition also had blank leather-bound journals and ink for the purpose of recording such encounters, as well as for scientific and geological information. They were also provided with various gifts of medals, ribbons, needles, mirrors and other artifacts which were intended to ease any tensions when negotiating their passage with the various Indian chiefs they would encounter along their way. As many of the tribes had had previous friendly experiences with British and French fur traders in various isolated encounters along the Missouri and Columbia Rivers, the expedition subsequently did not encounter any hostilities with the exception of the Teton-Sioux tribe under Black Buffalo [note 4] and the Partisan tribe on September 25, 1804. Both of these tribes were rivals and hoped to use the expedition to their own advantage and who both demanded tribute from the expedition for their passage over the river at that particular juncture. Captain Lewis made his first mistake by offering the Sioux chief gifts first, which insulted and angered the Partisan chief. Communication was difficult since the expedition's only Sioux interpreter, Pierre Dorion, had stayed behind with the other party and was also involved with diplomatic affairs with another tribe. Consequently, both chiefs were offered a few gifts, but neither was satisfied. At that point, some of the warriors from the Partisan tribe then took hold of their boat and one of the oars. Lewis took a firm stand, ordering a display of force, presenting arms; Captain Clark, by gesture of brandishing his sword, threatened violent reprisal. Just before the situation erupted into a violent confrontation, Black Buffalo ordered his warriors to back off. After the ensuing diplomacy and with the aid of better gifts and now a bottle of whiskey, of which some was consumed, the captains were able to negotiate their passage through without further incident. During the next two days, the expedition made camp not far from Black Buffalo's tribe. When they attempted to leave, other similar incidents occurred, but they were averted with still more gifts, this time, of tobacco. One of the primary customs that distinguished Indian cultures from those of the West was that it was customary for the men to take on two or more wives if they were able to provide for them and often took on a wife or wives who were members of the immediate family circle. e.g. men in the Minnetaree [note 5] and Mandan tribes would often take on a sister for a wife. Chastity among women was not held in high regard. Infant daughters were often sold by the father to men who were grown, usually for horses or mules. Though she has been discussed in literature frequently, much of the information is exaggeration or fiction. Scholars say she did notice some geographical features, but "Sacagawea...was not the guide for the Expedition, she was important to them as an interpreter and in other ways." The sight of a woman and her infant son would have been reassuring to some indigenous nations, and she played an important role in diplomatic relations by talking to chiefs, easing tensions, and giving the impression of a peaceful mission. ^ Commonly referred to in folk lore and various history texts as 'Crazy Horse'. 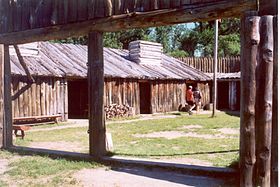 ^ John L. Loos, William Clark's Part in the Preparation of the Lewis and Clark Expedition. Missouri Historical Society. Retrieved October 3, 2011. ^ "Lewis and Clark, Journey Leg 13, 'Ocian in View! ', October 08-December 07, 1805". National Geographic Society. 1996. Retrieved October 22, 2016. Lewis, Meriwether; Clark, William (2003). Bergon, Frank, ed. The Journals of Lewis & Clark. Penguin. p. 560. ISBN 9780142437360. "Review of Travels to the Source of the Missouri River ...". The Quarterly Review. 12: 317–368. January 1815. Lewis, William; Clark, Clark (1903). Hosmer, James Kendall, ed. History of the Expedition of Captain Lewis and Clark, 1804-5-6, Volume 1. A. C. McClurg & Company, Chicago. p. 500. Lewis, Meriwether; Clark, William (2004). Moulton, Gary E., ed. The Definitive Journals of Lewis & Clark. University of Nebraska Press. p. 357. ISBN 9780803280328. Wikisource has the text of The New Student's Reference Work article Lewis and Clark Expedition. ^ Steven E. Ambrose. Undaunted Courage, Meriwether Lewis, Thomas Jefferson, and the Opening of the American West. Simon and Schuster Paperbacks 1996. This page was last edited on 11 November 2017, at 13:10.